For experiencing sheer wilderness visit Ranthambore National Park in Sawai Madhopur district of Rajasthan. It is a paradise for wildlife lovers who come here from across the globe. The Park takes pride in being the home of a variety of wildlife species. Tiger is the star attraction here. The Park was once the hunting ground of the erstwhile kings of Jaipur. It was established as a wildlife sanctuary in 1955 by the Government of India and became a National Park in 1980. 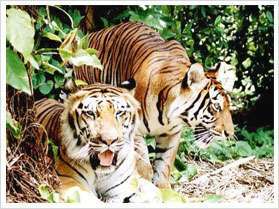 It is one of the tiger Reserves of India. Covering an area of 392 sq km, Ranthambore National Park is the only dry deciduous tiger habitat in the world. It is a picturesque park also housing the wonderful Ranthambore Fort. The park is famous for its tigers. The other interesting inhabitants of the Park are leopard, dhole, wild pig, sambar, nilgai, chital, Sloth Bear, Jackals, Marsh Crocodile, Leopard, Gazzelle, Indian Hare, Porcupines, Jungle Cat, Sambhar, Chinkara, spotted deer, jackal, Mongoose, Nilgai, Wild Boar and Monitor Lizards and gaur. The Park is also a heaven for bird lovers as it houses a variety of colorful birds such as raylag Goose, Woodpeckers, Indian Gray Hornbills, Common Kingfishers, Bee Eaters, Cuckoos, Parakeets, Asian Palm Swift, Owl, Nightjars, Pigeon, Dove, Crakes, Snipes, Sandpipers, Gulls, Terns, Great Crested Grebe, Eagles, Darters, Cormorants and Egrets. The Park also provides shelter to reptiles such as Snub Nosed Marsh Crocodiles, Desert Monitor Lizards, Tortoise, Banded Kraits, Cobras, Common Kraits, Ganga Soft Shelled Turtles, Indian Pythons, North Indian Flap Shelled Turtles, Rat Snakes, Russel's Vipers, Saw-scaled Vipers and the Indian Chameleon. The Park has shallow lakes, gentle slopes and plateaus which make it picturesque. Floral species like Banyan, Dhok, Mango and Pipal dominate the land of the Park. The other attractions of the Park are Ranthambore Fort, Jogi Mahal, Bakaula region (an area with dense forests and several water bodies), Lakarda and Anantpura( the site famous for offering views of sloth bears) and Raj Bagh ruins. The most favorable period to visit the Park is from October to March. By Air: The nearest airport is in Jaipur. By Rail: Sawai Madhopur district in which the Park is located is connected with the main cities like Jaipur, Delhi and Mumbai by rail. By Road: The Park is easily accessible by road from different cities of Rajasthan and cities like Delhi and Agra.